We are committed to providing our clients with tranquil interment spaces now and well into the future. Current burial sites are located throughout the property to accommodate a wide range of memorial styles. 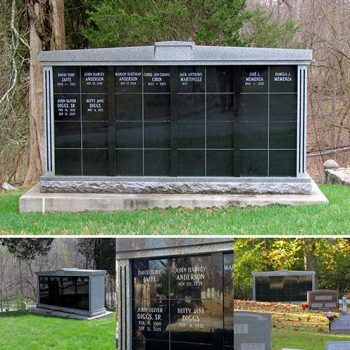 Rockville Cemetery offers burial space for both caskets and cremated remains, as well as niche inurnment for cremains in our columbariums. Rockville Cemetery is a Perpetual Care cemetery. (Burials) All casket burials require the purchase and installation of a grave liner (vault). (Grave Markers) Purchaser is responsible for independent acquisition of grave markers. All grave markers must have a concrete base installed at/below ground level. Providers must obtain Cemetery approval prior to marker installation. New Year’s Day, Easter Sunday, Memorial Day, 4th of July, Labor Day, Thanksgiving Day and Christmas Day. Accordingly, 10% of all fees for purchase of gravesites and niches are set aside in our Perpetual Care Account. Earnings from this account are used to conduct perpetual care activities, as defined above. MEMORIAL DAY & VETERANS DAY: Decorations may remain on graves for two weeks after each holiday, respectively. NATIONAL/STATE/MILITARY/PUBLIC SERVICE FLAGS may remain in place from Memorial Day through Veterans Day. The possession or application of any hazardous item or substance, or conduct of any activity posing risks to any persons, property or wildlife is prohibited. RCA assumes no responsibility for items left at grave sites, and reserves the right at its sole discretion to remove items considered unsafe, unsightly, unauthorized, or inappropriate, at any time. 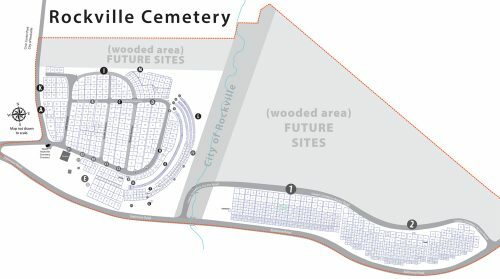 The intent of Rockville Cemetery Association (RCA) is to ensure that the cemetery property is maintained with the dignity and beauty befitting a sacred burial ground. RCA solicits your understanding and cooperation with our efforts. Fresh cut flowers may be placed on graves at any time. When fresh-cut flowers become unsightly they should be removed. RCA may remove and discard flowers that become unsightly. Flowers may be removed and discarded to allow for routine mowing or other grounds maintenance activities. 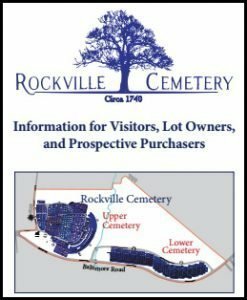 Water is not available at Rockville Cemetery. Plastic, metal, paper and fabric flowers and decorations may be placed on graves at any time. Appropriate containers must be used. Glass and ceramic containers are not permitted for safety reasons. Live potted plants are permitted on graves one week before and one week following Easter Sunday. Christmas wreaths are permitted on graves during the Christmas season and will be discarded beginning February 1. Wreaths should be simple in design and not contain extraneous decorations. Memorial Day and Veterans Day decorations will be allowed to remain on the graves for two weeks following those holidays. National, State, Military and public service flags will be allowed to remain from Memorial Day through Veterans Day. No item or object may be attached to a monument, marker or niche front. Monuments may not be altered in any way. Military medallions are the exception. Specific Items not permitted include permanent plantings (shrubs and trees), statues, vigil lights, breakable objects, balloons, pinwheels, stuffed animals and like items, bird feeders, and “shepherd’s hooks” with or without hanging baskets. Nothing placed on a grave may be taller than the monument. Unauthorized items may be removed and disposed of by RCA. RCA reserves the right in its sole discretion to remove unauthorized, unsightly, hazardous, and inappropriate items at any time. If you have questions, please contact the RCA Board. RCA assumes no responsibility for items left at graves, columbaria or niche fronts. Due to the open nature of the grounds, RCA cannot guarantee against theft, vandalism or the effects of nature, including damage by wildlife. The first line of text, or the first two lines as required for longer names, shall be reserved for the name of the person inurned in the niche. The next line below the name shall be reserved for birth and death years, with a hyphen separating the two dates. If full birth and death dates (month, day, year) are used, the dates shall be inscribed on two lines. • For full birth and death dates, the standard format shall be month (three-letter abbreviation with a period, except for June and July which shall be spelled completely), day (one or two digits), and year (four digits). The standard font shall be Press Condensed Roman. • Names shall be inscribed at 1.50” in height. • When two lines are used for the name, the first line (first and middle names) shall be 1.25” in height, and the second line (surname) shall be 1.50” in height. • Dates shall be inscribed at 1.0” inches in height. • Additional text (e.g. “Beloved Wife”) shall be inscribed below the last date line at 1.0” in height. • Symbols shall be inscribed at 1.75” inches in height, and located above the first name line. Any deviation from these policies must be approved by the RCA Board of Directors. Procurement and installation of headstones and grave markers are the responsibility of the lot or gravesite owner(s). Gravestones and markers must be professionally installed by a qualified contractor or person, with a proper foundation according to industry standards, so as to promote their long-term viability and stability. This includes installation of an appropriate concrete foundation to support the gravestone or marker. Lot and gravesite owners are required to contact the Cemetery prior to placement of a headstone or marker, so the proper location may be verified and marked prior to installation of the foundation. If a gravestone or marker is installed in the wrong location, and the Cemetery was not given the opportunity to verify and mark the location, the owner(s) will be held responsible for the removal and re-installation of the gravestone or marker. Lot and gravesite owners are responsible for the maintenance and care of headstones and markers in perpetuity. Owners are expected to maintain headstones and markers in good, stable and clean condition, and to initiate repairs or replacements should it become necessary.